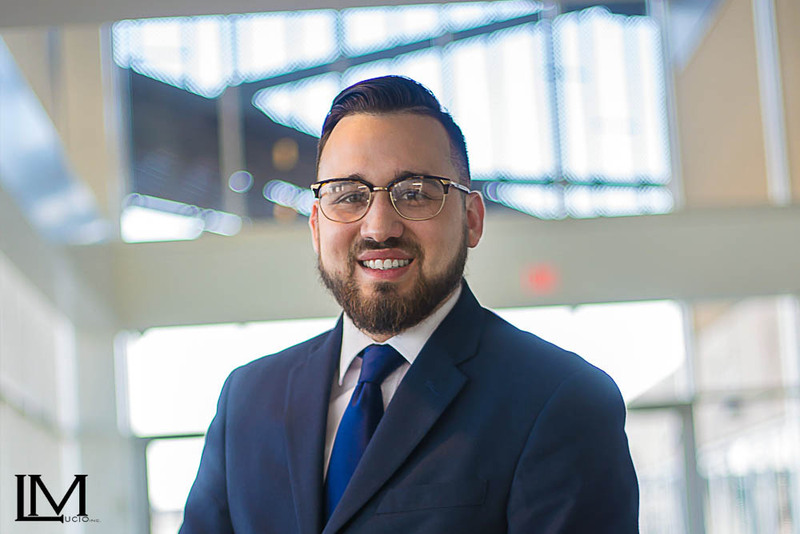 Team Member Spotlight Series: Lorenzo Reyna | Lucio Marketing, Inc.
Meet Lorenzo Reyna, an essential team member here at Lucio Marketing. We are very excited to have Lorenzo on board our ever-growing team. 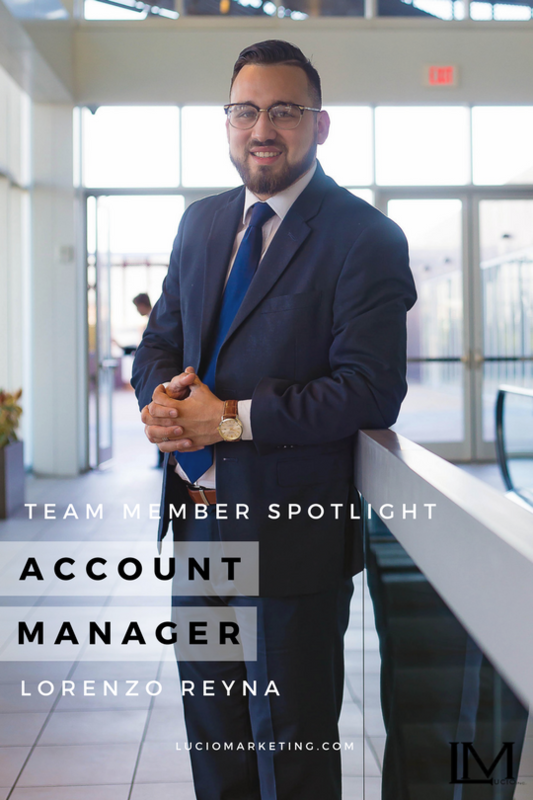 Lorenzo is one of our top Account Managers who is helping lead our team to success. Lorenzo has both a creative and business mentality, and is often the one behind the camera at our business trips. Besides his great photography skills we know Lorenzo is developing into a great leader. Lorenzo is an outstanding Account Manager who is helping shape our business, a growing entrepreneur, and our featured Lucio Marketing Team Member this week in our Team Member Spotlight Series. Like all our Account Managers, the skill Lorenzo brings to the team is greatly appreciated. A: My family. I want to be able to provide my wife and children a future that screams prosperity. I want to be able to show the world the power that God and a positive mentality can have on someone’s life. A:The opportunities here are endless! Not to mention in just 5 months I’ve traveled to Dallas, Grapevine, Orlando, and Miami! A: I have been in all types of businesses, even running one of my own, but what keeps me passionate about this one is the team. We have high standards and an immense amount of energy! We get to wake up every day and dress our best! I’m passionate about fashion so it works hand in hand! A: My music studio, and photography studio. I’ve developed quite the creative outlet. Sometimes just a small job making invitations can help feed me creatively. A: Team nights at Main Event is the spot! A: Lucio Marketing has taught me all types of business techniques! How to conduct conference calls, how to manage a team, as well as helping me to build my own brand. A: Entrepreneurs encouraging entrepreneurs! Everyone sharing positive energy creates for a great working environment! A: We have great team nights at Buffalo Wild Wings! Plus free food, nothing better than that! A: Grapevine Texas on the balcony of my hotel room! Overseeing the Texan Hotel, and networking with the Assistant Director. A: I’m inspired by my Mother. She has done nothing but work hard her whole life! She raised me the best way she could and I want to do the same for my family! A: I like when they bump Michael Jackson! A little Daft Punk never hurt anyone either. A: “Be Humble & Hungry!” You can’t be humble and not hungry. You can’t be hungry and not humble. You have to be both! A: It has changed my life! Inside and outside the office! It is not just a manger training program its personal development! A: It’s not easy but it’s worth it! A: Self-worth is Net-worth & to God be all the glory! Jesus is my everything! He is what got me here and He is what will continue to carry me forward toward my ultimate destiny! Also a big thank you to Lucio Marketing for this amazing opportunity!!! If you want to find out more about Lorenzo’s work or about Lucio Marketing and what we do, follow us on our social media channels.